Once more unto the breach, that I may finally break down the walls that keep my voice silent. A couple of months back, a new deck found me. While waiting for a table to have brunch with some friends at the Spring Green General Store, I decided to look through their gift selection, without any real intention to buy anything. 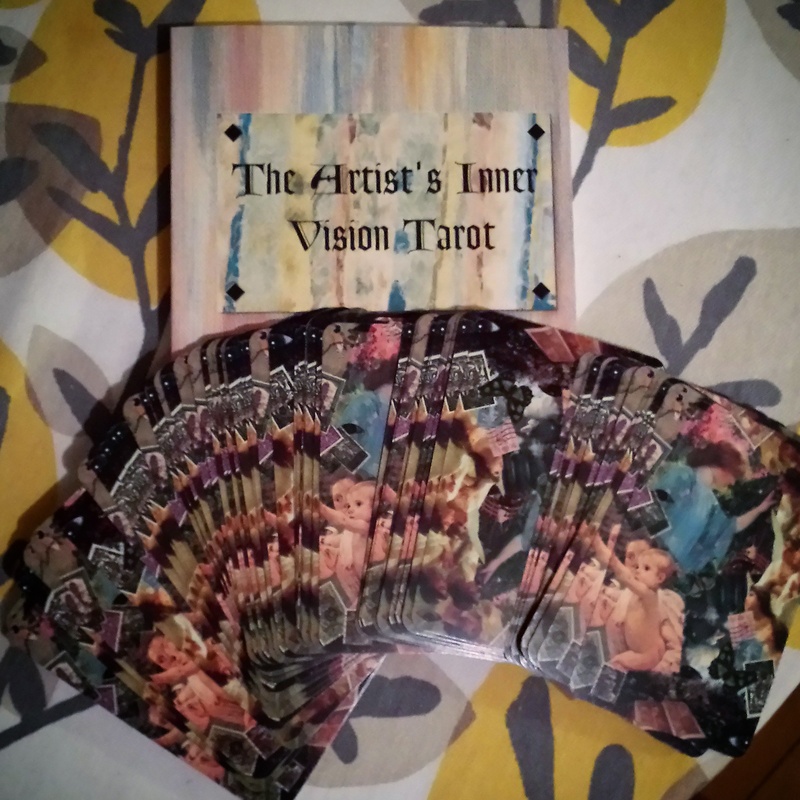 But then, among the usual gift shop fare of cute note pads, figurines, cheesy t-shirts and children’s toys, I spotted the one metaphysical item they carried: Their last copy of “The Artist’s Inner Vision” Tarot, by No Monet. 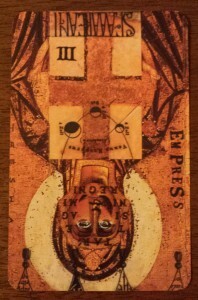 This strange and beautiful deck, now out of print, was discounted down to $20 from the original $40, which put it right within my price range, and I immediately grabbed it. I decided this would be my official writing deck, and would help me connect with my creative voice. This brunch took place right before our latest visit to The House on The Rock. If you’ve read Neil Gaiman’s American Gods, you can appreciate the effect that a visit to that place has for a creative person: his description of the place as a “place of power” was very apt. A great fountain of creativity was accessed and channeled by Alex Jordan, a sensitive soul who felt the beauty of the place and brought forth one of the biggest, most bizarre, whimsical and original works of art ever created. I had been looking forward to my second visit to this attraction as a source of inspiration. I’ve been in the process of trying to reawaken my muse for a few years now, fighting against the fears and judgment’s I’ve allowed myself to be burdened with, and felt this tarot deck was a gift from my guides, to help me along. I said some prayers, drew some symbols on the bag the deck came in with scented oils, and then walked through the House on the Rock, shuffling through the deck and willing the energy from the place to be infused into the deck. It felt electric, like I was walking on air the whole time I was there. I kept seeing Kwan Yin depictions in so many places, when their prevalence didn’t register at all the first time I visited. 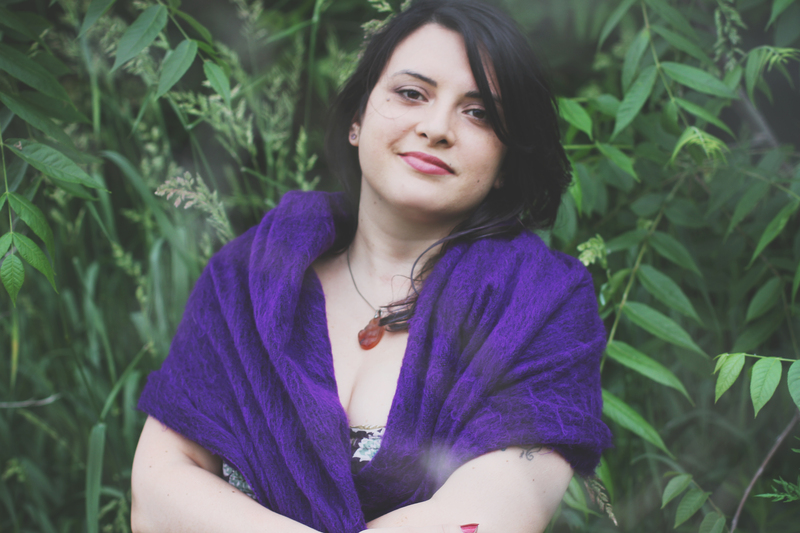 I felt the Divine Creative Feminine presence surrounding me, and had every certainty my little magic spell worked. And then I put the deck in a drawer of my altar table, and there it stayed from April until today. Months ago I had begun writing the last couple of entries in my introductory blog series of sorts, and one of them talks about how I stopped singing for a long time… Tonight, with great anticipation, after meditating and thinking about what my next blog entry should be about, I drew a card… and it was The Empress, reversed. I guess I need to finish what I started! This entry was posted in Jen's Story and tagged in Artists Inner Vision, inspiration, tools.